There is but one true and living God, infinite, eternal and unchangeable. He is perfect in love, wisdom, power, holiness, justice, goodness and truth. The unity of the Godhead exists in three persons of the same divine essence; the Father, the Son (Jesus Christ) and the Holy Spirit who are one God, co-equal, co-existent and co-eternal (1 Thess. 1:9; John 4:24; 1 Tim. 1:17; Matt. 28:19). The Scriptures, both the Old and the New Testaments, are verbally inspired, infallible and without error, and not only contain the Word of God but are the Word of God. These Scriptures are the supreme and final authority in all matters of faith and conduct for the believer and are only spiritually understood by the work of the Holy Spirit within the believer, The New Testament, being utterly reliable, gives testimony to the character and authorship of the Old Testament (2 Tim. 3:16; 2 Pet. 1:21). God has created all things out of nothing; the heavens, the earth and all that is in them and sustains all things for His own praise and glory (Gen. 1:1; Col. 1:16; Acts 17:25-28). We believe in the utter depravity of human nature as a result of the historic fall of Adam who was created by God after His own image in knowledge and holiness, to enjoy perfect fellowship and communion with Him. As a result of the sin of Adam, all mankind are not only born into the world under the guilt and condemnation of that sin imputed to them, but also possess a corrupt and sinful nature. (Gen. 1:26; 3:6-8; Rom. 5:12, 15-19). God in his mercy has planned from all eternity to save an innumerable multitude of people and predestinated them to everlasting life, not on account of good works or faith but entirely of his sovereign will and pleasure. His elect people, although fallen, are redeemed in Christ, effectually called by the gospel to repentance and faith, justified, adopted, sanctified, caused to persevere to the end and finally glorified (Rom. 8:30; Eph. 2:4-9). We believe in Christ’s essential deity, virgin birth, real and perfect manhood and sinless human nature. He is the one and only mediator between God and man, by virtue of his human life of perfect obedience on this earth, and his substitutionary sacrifical death as a propitiation for sin. He rose from the dead literally and bodily as an historical event on the third day and ascended into heaven, where he intercedes for his people at the right hand of the Father, and rules over all things (1 Tim. 2:5; Gal. 4:4; Heb. 4:15; Rom. 3:25; Jn. 17:2; 1 Cor. 15:3-4; Eph. 1:22; Mk. 16:19; Rom. 8:34). The sinner is justified solely by grace through faith in the atoning merits of our Lord and Saviour Jesus Christ. Justification is an act of God’s free grace, whereby He pardons all our sins and accounts us righteous in his sight (Rom. 4:5-8; Gal. 2:16). The work of the Holy Spirit is essential for a full outworking of redemption, procured for us once for all by Christ. The new birth, by which the sinner is enabled to repent and believe, is not an act of his own will and power but the result of the sovereign effectual operation of God the Holy Spirit. 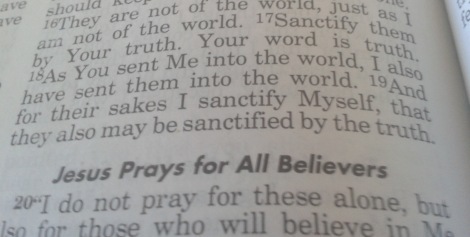 That work of the Holy Spirit is also essential for sanctification, ministry and spiritual worship (1 Cor. 2:14; John 3:8). God sanctifies the believer, enabling him more and more to die to sin and to live in conformity to the revealed will of God. Although sanctification is progressive, it is never complete in this life and the believer experiences constant warfare between flesh and spirit. The Ten Commandments, although they cannot save a man, are an expression of God’s holy character and his revealed will for men. Thus they are binding on all men and remain the believer’s rule of life (Eph. 3:16-19; Gal. 5:17; Matt. 5:17-19; Gal. 2:16). The universal church comprises the whole company of God’s redeemed people, which finds visible expression in the local church, which is a company of God’s faithful people meeting together for the worship of God. Christ has instituted the two ordinances of Baptism and the Lord’s Supper. Neither convey regenerating grace, or are essential to salvation, but are outward and visible signs of inward and spiritual grace to be observed by all believers. The Lord’s Supper is not a sacrifice, and no change occurs in the bread and wine (Matt. 28:19; 1 Cor. 11:23-26; Heb. 9:22-28). There are only two permanent offices in the church prescribed by Scripture. Firstly that of elder, to whom is entrusted the oversight of the congregation and the ministry of the Word. Secondly that of deacon, to whom is committed the benevolent and administrative work of the church (1 Tim. 3:2-13; Acts 6:1-6). At death, the souls of believers are made perfect and received into the immediate presence of Christ, whilst the souls of the unrighteous go to Hell to await the last judgment. At the end of the present age, the Lord Jesus Christ will return visibly and personally in power and great glory. The dead will be raised bodily, the living will be changed and all men will be judged. The wicked will be consigned to Hell to suffer the just and everlasting punishment for their sins. The godly will enter into everlasting joy with Christ in the new heaven and new earth (Phil. 1:23; Luke 16:23-24; Acts 17:31; 1 Cor. 15:51-52).